The sports industry has an expected value of over $73 billion by 2019, and a master’s in sports management online will help you succed in this soaring field. With positions in advertising, talent representation, and front offices, opportunities in sports are nearly as vast as the industry itself. As the industry grows, so too does the need for qualified, innovative people. With a degree in sports management, sports and business intersect to turn one’s passion for the game into a career. According to the North American Society for Sport Management, 243 postsecondary institutions offer undergraduate or graduate programs in the field. Additionally, the U.S. Bureau of Labor Statistics (BLS) reports that spectator sports is the third biggest employer of talent agents in the nation, with individuals earning an average of $104,530 annually. What’s more, the BLS projects 10% growth over the next decade (2016-2026) for marketing managers, public relations specialists, and athletic directors. Now is a perfect time to consider joining the lucrative and exciting field of sports management. University of Florida Distance Learning ranks #1 on The 25 Best Online Master’s in Sports Management Degree Programs! Located in Gainesville, the University of Florida welcomes students of all backgrounds with over 170 distance education degree programs, including an online master of science in sports management. This comprehensive graduate track combines experiential learning based on research and practicum opportunities with the flexibility of remote, asynchronous coursework delivered through the Canvas learning platform. Students develop the administrative, marketing, and physiological skills needed to help keep athletes healthy and contribute to an organization’s growth. The curriculum requires students to complete 36 credits; most distance learners graduate in two years. Required coursework includes sports marketing, sociology, and leadership, as well as a research core in human performance methods and evaluation. After completing 27 credits, degree candidates must also complete a capstone experience that consists of writing self-reflective essays. This degree track stands out from many other online master’s programs in sports management in that it offers several specialization options, including athlete development, sport law, or high performance training. These concentrations provide students with more control over their degree plan, preparing them for specific careers. UF does not require students to complete a practicum, but the school does provide placement assistance for students who want to pursue opportunities with any of the school’s institutional partners or organizations in their communities. The program admits students four times each year. The University of Texas at Austin ranks #2 on The 25 Best Online Master’s in Sports Management Degree Programs! To earn this master’s in sports management, online students complete 30 credits of coursework. Required topics include organizational behavior, legal issues in sports, and facility and event management. Faculty deliver online courses in accelerated, six-week sessions, which students can take year-round. There is no thesis requirement. However, as one of the top public research schools in the country, UT Austin provides ample assistance to students who elect to pursue self-directed academic and professional projects. This assistance comes in the form of faculty support, funding resources, and access to state-of-the-art software and technologies. Georgetown University ranks #3 on The 25 Best Online Master’s in Sports Management Degree Programs! Georgetown University is located in Washington D.C. and regularly earns recognition for its academic rigor and the accessibility of its distance education programs, which include an online master’s in sports industry management. Through a curriculum that emphasizes global perspectives in the sports field, students develop the theoretical knowledge and practical skills needed to pursue careers in collegiate athletics, facility operations, professional franchises, and even in the nonprofit sector. Georgetown does not require any on-campus residencies, letting students earn their degree entirely online in fewer than two years. This online master’s in sports management program totals 33 credits. Students take fundamental courses in business and marketing, while also pursuing advanced topics like applied ethics, social responsibility, and globalization in sports. In addition to individualized attention in the classroom, students enjoy professional guidance, mentoring, and internship support. The curriculum culminates with a capstone project, which students complete with the help of a faculty advisor and a professional sponsor. Degree candidates present this work to a panel of industry experts. All online classes consist of 7.5-week sessions, except for the 15-week capstone experience. Northeastern University ranks #4 on The 25 Best Online Master’s in Sports Management Degree Programs! Founded in 1898, Northeastern University is a research and academic institution that offers distance education programs through its Global Network, including an online master’s in sports leadership. Grounded in experiential learning and ethical leadership, this program prepares students for careers in sports-related marketing, communication, and management. Prospective students should note that this is a hybrid track. While most courses can be accessed online asynchronously through Blackboard, some required classes involve in-person attendance at the Boston campus over summer sessions. Part-time students generally earn their master’s in two years, while those enrolled full-time can finish in just one. The degree plan consists of 45 quarter credits in classes such as sports law, media relations, and organizational management. Students take additional coursework to pursue either a professional sports or collegiate athletics administration concentration. Learners also complete six elective credits. The Northeastern program culminates in either an internship or capstone experience. Both options provide students with industry experience through hands-on skill development and networking opportunities, which they subsequently document and analyze in a web portfolio. The capstone experience requires intensive research and a final paper; this choice may be more suitable for students already working in the sports industry. Washington State University ranks #5 on The 25 Best Online Master’s in Sports Management Degree Programs! Washington State University was established in 1890 as the state’s original land grant college. Today, WSU offers over 79 graduate degree programs, including distance education options like its online master of arts in education - sport management. Through a curriculum that blends theory, research, and practical experience, students develop the business and instructional skills needed to join the ever-growing sports industry. Graduates go on to work in positions as community program directors, franchise marketing specialists, and corporate managers. Degree candidates choose from either a thesis or non-thesis curriculum, both of which feature 34 credits. Coursework covers sport media and communication, administrative concepts, values and ethics for educational leaders, and at least nine elective credits. All students also complete core research requirements that teach them the fundamentals of conducting qualitative inquiry and analyzing statistics. Non-thesis students finish their studies with a comprehensive examination, while their counterparts carry out original research that tackles a challenge in the field. Thesis students also defend their ideas in a culminating event open to the public. WSU delivers asynchronous online courses through Blackboard. Northwestern University ranks #6 on The 25 Best Online Master’s in Sports Management Degree Programs! Based in Evanston, Illinois, Northwestern University offers eight graduate degree programs to distance learners. Among these options is an online master of arts in sports administration, which strongly emphasizes the business aspects of the industry, from creating strategic and financial plans to assessing performance using statistical information. Students may earn their degree entirely online or they can opt for a hybrid experience that integrates flexible on-campus classes. The university provides internship opportunities across the U.S. as well as resources through its career advancement office. Northwestern graduates go on to occupy positions that include corporate consultants, sports agents, and team executives. This online master’s in sports management program consists of 11 courses, covering topics like legal and ethical issues, labor relations, and intercollegiate sports management. The degree plan also contains a perfunctory leadership class that teaches students communicative strategies and their applications in a professional setting. Distance learners enjoy exclusive access to a sports analytics specialization that covers the programming and mathematical modeling skills needed to evaluate individual players, entire teams, and related administrative initiatives. Students round out their education by completing either a thesis project or a capstone class. Faculty deliver online, asynchronous courses through the Canvas learning management system. Texas A&M University ranks #7 on The 25 Best Online Master’s in Sports Management Degree Programs! Established in 1876 as the state’s first public institution of higher learning, Texas A&M University enrolls approximately 62,500 students annually. The school offers over 170 graduate degree programs, including distance education pathways like its online master of science in sport management. With three entry dates in April, October, and February, as well as no thesis requirement, this program provides students with a flexible, comprehensive education that prepares them to work as administrators and leaders. To earn their master’s in sports management, online students complete 36 credits, including a research core and advanced classes like personnel management, revenue generation, and diversity in sports organizations. The curriculum also allows students to take electives to explore additional topics in the field or complete courses in related subjects such as marketing, international business, or education. Degree candidates finish their studies with an internship where they develop practical skills and reflect on their professional experience by writing journal entries and a final paper. Distance learners can complete this internship with one of the university’s business partners or with an organization in their area. Those already working in the sports industry may opt to fulfill this requirement through their employer, although not in the same capacity as their current job. Texas A&M University - College Station is regionally accredited by the Southern Association of Colleges and Schools Commision on Colleges (SACSCOC). University of Massachusetts–Amherst ranks #8 on The 25 Best Online Master’s in Sports Management Degree Programs! The University of Massachusetts is located in Amherst and enrolls nearly 7,000 graduate students in 77 degree programs. These include distance education opportunities like the school’s online master of business administration with a focus in sport management. With a curriculum based in the field’s best practices and current trends, this program prepares learners for careers in all aspects of the sports industry, from facilities operations and program management to consumer sales and market data analytics. Outside the classroom, students can access career advice and professional development opportunities through the university’s large network of alumni and corporate partnerships. The University of Massachusetts - Amherst is regionally accredited by the New England Association of Schools and Colleges (NEASC). The Isenberg School of Management receives specialized accreditation from the Association to Advance Collegiate Schools of Business (AACSB). Virginia Commonwealth University ranks #9 on The 25 Best Online Master’s in Sports Management Degree Programs! Liberty University Online ranks #10 on The 25 Best Online Master’s in Sports Management Degree Programs! Based in Lynchburg, Virginia, Liberty University boasts a robust distance education platform with over 289 programs, including an online master of science in sport management. With fully remote coursework and nine specialization choices (including thesis and non-thesis options), students can work and pursue their degree simultaneously. The curriculum combines industry best practices with business and marketing skills, enabling graduates to pursue work as event planners, athletic marketers, facility managers, and sports broadcasters. The degree plan totals 36 credits, which most students complete in fewer than two years. Required classes cover topics in social issues, marketing and public relations, and financial management for sport industry professionals. Students take advanced courses in their specialization, choosing from tourism, sports administration, outdoor adventure sport, coaching and athletic administration, or a generalist track. Learners do not need to complete a practicum, but they can use departmental resources to access internship opportunities. The program culminates with a comprehensive exam. Faculty deliver asynchronous, online classes through Blackboard. Students can also enroll in accelerated, eight-week courses to hasten graduation. Troy University ranks among The 25 Best Online Master’s in Sports Management Degree Programs! Founded in 1887 as a normal school, Troy University is now a comprehensive institution that offers graduate students 40 distance education programs, including an online master of science in sport and fitness management with a sport management concentration. The learning structure of this program combines seminars, lectures, and practical experiences to propel students into leadership roles. Graduates can go on to work for recreation departments, Division I athletic programs, and professional sport organizations. The degree plan totals 36 credits and students may choose either a thesis or non-thesis track. In addition to required courses in statistical analysis and research methods, degree candidates pursue advanced topics like consumer behavior, revenue generation, and sociological aspects in sports management. With the aid of a faculty advisor, thesis students conduct research and propose solutions to challenges in the industry. Alternatively, non-thesis students take more elective classes. Distance learners access asynchronous, 16-week courses through the Canvas platform and gain access to resources through a digital student union where they can connect with other learners from across the globe. Drexel University ranks among The 25 Best Online Master’s in Sports Management Degree Programs! Located in Philadelphia, Pennsylvania, Drexel University stands as one of the largest private institutions of higher education in the U.S., hosting over 200 academic programs. These offerings include distance education opportunities, such as the school’s online master of science in sport management. Designed for industry professionals and newcomers alike, this program trains students to plan, implement, and assess sports programs and carry out related administrative tasks. Offered as a part-time study plan, most degree candidates finish in fewer than two years and move on to careers in areas like corporate sponsorship, player personnel and draft analysis, and visual sports journalism. The 45-quarter-credit curriculum includes required courses related to negotiations for leaders, sports economics, and managing the total enterprise. The degree plan also consists of 12 elective credits, which students utilize to craft a focus area related to their career interests. Additionally, to earn their sports management master’s degree, online learners complete an experiential component, choosing from a senior seminar, internship, independent study, or research project/thesis. Although all aspects of the program can be completed remotely, students have the option of attending a four-day summer campus residency where they engage with guest speakers and network with peers and industry professionals. American University ranks among The 25 Best Online Master’s in Sports Management Degree Programs! American University delivers distance education coursework through Blackboard, offering six graduate certificates and degrees as well as several individual and non-degree classes. Included among these offerings is an online master of science in sports analytics and management, which focuses on the data-driven nature of organizational planning and leadership. With a curriculum grounded in emerging technologies and intercultural communications, students develop the skills needed to pursue the next generation of sport industry careers, from performance analysis and interactive spectatorship to e-sports gaming and virtual reality. Totalling 30 credits, AU’s online master’s in sports management program contains required courses in data-driven decision making, project cost-benefit analysis, and client communications and professional consulting. Students round out their education with an elective class and a capstone experience. The latter tests students’ strategic thinking and understanding of applied research and assessment, culminating in a written business plan and presentation. To facilitate professional development, AU also offers distance learners career-relevant webinars and practicum opportunities. Learners may also seek out guidance and resources through the school’s adult career coaching center, which provides job search, resume review, and networking assistance. Temple University ranks among The 25 Best Online Master’s in Sports Management Degree Programs! Temple University stands as a leader in the sports administration field, offering related degree programs since 1908. Today, distance learners can access graduate-level academics through the school’s online executive master of science in sport business program. Tailored for professionals with experience in the industry, this degree track teaches students the advanced strategic management and marketing skills needed to become leaders in their organizations. Part-time students can earn their master’s in two years, while full-time participants can graduate in as few as 13 months. Temple graduates go on to work at sporting good companies, sport governance organizations, and athletic representation agencies. The 30-credit degree plan covers financial management, global business strategies, and understanding sport consumers. The program does not contain any internship requirements or campus residencies, enabling students to complete all work remotely. Faculty deliver online courses through the WebEx learning platform. While most classes feature asynchronous instruction, distance learners also participate in live weekly sessions that allow them to discuss course materials and build relationships with their teachers and peers. During these live sessions students engage in small group projects where they solve practical challenges faced by sport managers. Western Carolina University ranks among The 25 Best Online Master’s in Sports Management Degree Programs! Based in Cullowhee, North Carolina, Western Carolina University enrolls over 11,000 students annually, many of whom earn their degrees remotely through one of the school’s 16 distance education programs. These online offerings include a comprehensive online master of science in sport management that trains students to lead teams, administer programs, and execute and assess strategic projects. This program emphasizes flexibility with no prerequisite requirements and fully asynchronous online coursework. Full-time students can earn their degrees in one year. Part-time learners typically finish in two years, but there is no required minimum course load as long as students complete the program within six years. University of Southern Mississippi ranks among The 25 Best Online Master’s in Sports Management Degree Programs! With students from all 50 states and 72 countries around the world, the University of Southern Mississippi’s academic programming has a global reach. Distance learners can select from 30 graduate programs, including an online master of science in sport management. This program develops critical thinking and problem solving skills, exposing students to research and best practices in the sport industry. Graduates can work as talent scouts, operations managers, and franchise marketing specialists. Distance learners may earn their master’s entirely online through asynchronous courses delivered by Canvas or through a hybrid experience that mixes in traditional classes on the Hattiesburg campus. Most students finish the program in fewer than two years. Georgia Southern University ranks among The 25 Best Online Master’s in Sports Management Degree Programs! Old Dominion University ranks among The 25 Best Online Master’s in Sports Management Degree Programs! Saint Leo University Online ranks among The 25 Best Online Master’s in Sports Management Degree Programs! Adelphi University ranks among The 25 Best Online Master’s in Sports Management Degree Programs! The 36-credit degree plan consists of foundation, core, and specialization classes. Covered topics include research methods, emergent technologies, and sport management personnel and program evaluation. Students pick from either a collegiate administration or sport marketing specialization. The former focuses on facilities management and media relations specific to athletic departments, while the latter emphasizes product branding, corporate sponsorship, and promotional campaigns. In lieu of a residency, the program culminates with a capstone course centered on in-depth research of contemporary challenges in the sport industry. The university provides online, personalized academic advising and online tutoring services. Program participants also gain access to an alumni network that helps them find internships and pursue industry certifications. 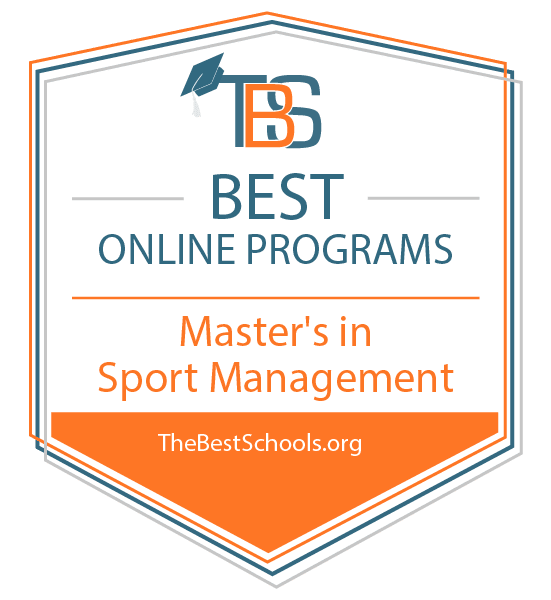 Gonzaga University ranks among The 25 Best Online Master’s in Sports Management Degree Programs! Gonzaga’s online master’s in sports management program contains no residency requirements. Students take all of their eight-week courses remotely in an asynchronous format facilitated by the Canvas platform. Individuals typically earn their degree in two years. Totalling 31 credits, the curriculum includes sport and athletic promotion, ethical and legal aspects, and facility management. Distance learners also fulfil an internship experience where they engage in at least 175 hours of hands-on work experience and complete accompanying writing assignments. Internships can be carried out at an approved organization in their community or with one of Gonzaga’s partners, like the Seattle Mariners. Degree candidates round out their education with a capstone project where they create a final portfolio of work, which is presented in front of peers, faculty, and industry professionals. DePaul University ranks among The 25 Best Online Master’s in Sports Management Degree Programs! DePaul University offers four graduate-level distance education programs, including an online master of science in sport, fitness, and recreation leadership. Designed for sport industry professionals seeking to advance in their careers, this program emphasizes data-driven decision making, ethical management techniques, and the holistic care of individuals in recreation and fitness settings. From a main campus based in Chicago, Illinois, DePaul provides distance learners with flexible, asynchronous coursework through the Desire2Learn platform. Students also undergo hands-on skill development by completing two residencies. Graduates stand prepared for leadership positions in corporate fitness centers, university athletic programs, and professional sport franchises. Mississippi College ranks among The 25 Best Online Master’s in Sports Management Degree Programs! Located in the city of Clinton, Mississippi College enrolls over 5,000 students every year, making it the state’s largest private institution of higher education. MC offers 19 graduate programs for distance learners, including an online master of science in athletic administration. Through a core curriculum and specialization options that focus on strategic and financial management, students develop the skills needed to lead successful sport programs at secondary schools and college departments. Faculty deliver online courses asynchronously through the Moodle platform. Most students earn their degrees in fewer than two years. University of Northern Colorado ranks among The 25 Best Online Master’s in Sports Management Degree Programs! West Virginia University ranks among The 25 Best Online Master’s in Sports Management Degree Programs! An online master’s in sports management combines theoretical instruction with practical experience, preparing graduates for management and administrative roles at all levels. With a master’s in sports management online degree, students learn effective management techniques such as understanding team dynamics, motivating people, and making sound decisions. Core courses of a master’s in sports management cover the same ground as an advanced management degree, but from the perspective of the sports industry. A typical curriculum includes classes in marketing, economics, accounting, and communication, with additional courses in psychology, social issues, and sports ethics. Students in an online master’s in sports management program tailor their curriculum by focusing on areas such as leadership, global business, collegiate sports, or analytics. The latter has become increasingly important as professionals use data to inform on- and off-field moves. A leadership focus, meanwhile, prepares graduates to lead from the front office as a general manager, athletic director, or marketing director. An internship is also an important component of an online master’s in sports management program, as it gives students the chance to gain important industry experience and explore a potential career track.